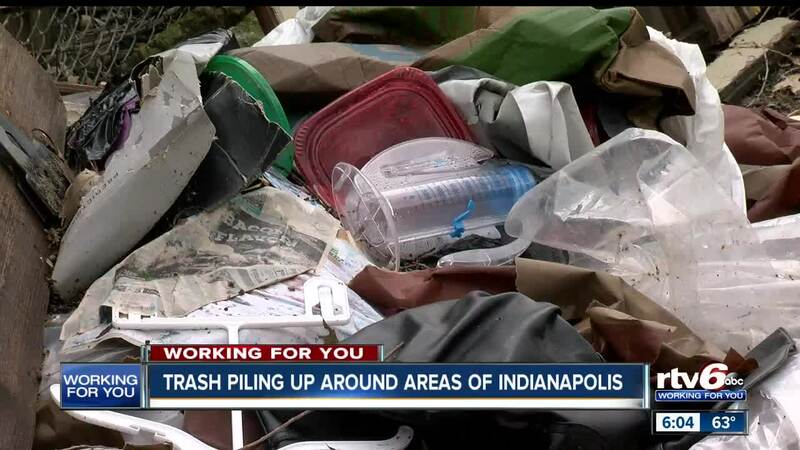 Trash piling up around areas of Indianapolis. INDIANAPOLIS — Trash issues keep popping up throughout the city, and neighbors are getting frustrated with the mess. It's a consistent issue that is challenging the city. Debris, broken glass, a door and more were dumped out of a car into the back alley of Angela Posley and her mother home. Posley's mom reported it to the Mayor's Action Center three weeks ago. The Department of Public Works has yet to clean it up. "Do it to your own property," Posley said. "If you're that lazy, that trifling, that you can't even take it out for heavy pick up and you're going to put it behind somebody's house where you know older women live there? Somethings wrong." On the west side of the city, near West Morris Street and Plainfield Avenue, RTV6 found TVs, tires and a couch left along the side of the road. DPW says most of their staff is focused on filling potholes right now. Illegal dumping is picked up as scheduling allows. The Department of Business and Neighborhood Services says they have opened 40 cases of illegal dumping this year. A new installment last year was a camera being placed in areas known for being hot spots for illegal dumping. That's been able to help in the prosecution of four cases thus far. Once a complaint is made through the Mayor's Action Center, the Department of Business and Neighborhood Services sends out an inspector to investigate. If it's in the public right-of-way - such as a street, alley or sidewalk - DPW is tasked with removing the trash or debris. If trash is on private property, the owner will receive a notice of violation, and a follow-up inspection will be scheduled 12 days after. If Indianapolis residents are interested in picking up litter and helping beautify communities, Keep Indianapolis Beautiful has kicked off the 2019 Great Indy Cleanup for April. A large-scale beautification day is planned for April 27 in the My Christian Park neighborhood, with KIB leading more than 400 volunteers, to care for the area surrounding Christian Park. Volunteers can register at www.kibi.org/projects [kibi.org] .